Thirty two years ago, when I embarked on my “learn to cook” adventure, I bought a set of pots and pans. They were RevereWare, a set of 12 (1-, 2-, and 3-quart saucepans; 8- and 10-inch frying pans; a 5-quart Dutch oven; and a 8-quart stockpot) with copper bottoms. I had a choice of plain stainless or copper, and I chose the latter because I thought they looked better. Little did I know how much trouble those copper bottoms would cause. They were thin enough to make no significant addition to the pots’ heat retention, but required constant cleaning. I kept those pots shiny for years; I learned the discipline of caring for one’s tools, which I continue to do to this day. I let the bottoms oxidize because most of the pots were backups, replaced by better made, heavier pots from Calphalon and All-Clad. The frying pans died horrible deaths at the hands of former housemates who left them empty on stove burners one time too often. All-Clad pans are as good as cookware gets, but they are also hideously expensive.I made few judicious purchases – 3-quart saucepan, 12-inch skillet, 14-inch sauté pan – and kept my eyes open for a good deal on replacements for the RevereWare. After reading about a cookware comparison on Serious Eats, and then seeing the same recommendation in Cook’s Illustrated, I finally bought a new set of Tramontina pots, seen above. They’re heavier and thicker-walled than my old pots, easier to clean, and perform better on the stovetop. The saucepans are 2- and 3-quart, the skillets are 8- and 10-inch, and the Dutch oven holds 5 quarts. The only downside was having to bite the bullet and purchase then from Wal-Mart, the exclusive distributor for Tramontina cookware. Lest you think I’ve given up on copper pots, I recently received a few pieces from a family friend who was remodeling her kitchen. 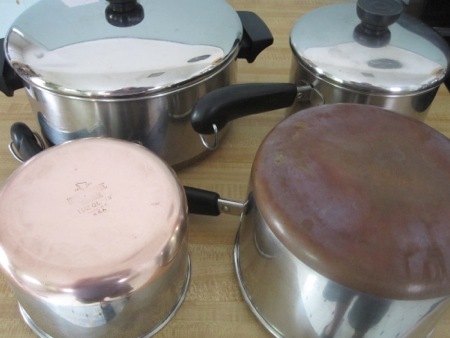 I guess her copper ware was decorative instead of functional, but before she simply tossed the pots in the trash, my mother suggested giving them to me. The oval dish, frypan, and small sautée pan are new, the larger covered sauté pan is an older French import – a clearance sale find than cost me all of 20 bucks. 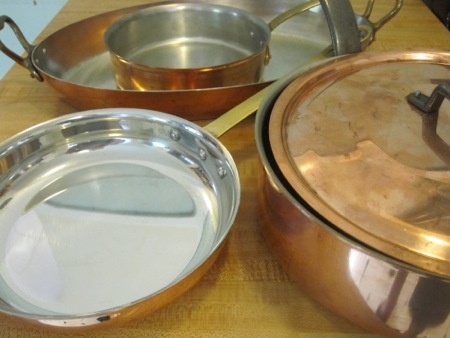 So now I have even more copper to polish, but the pans are a joy to cook with. As for the RevereWare, it’s been boxed up and put into storage. Someday He Who Will Not Be Ignored will head off to college, and he may very well begin his own cooking lessons with my pots. Interesting, thanks! I had Serious Eats in my reader for a while but dropped it – too much stuff I personally don’t care about to make up for the few (but excellent) articles I did. I’m a heathen, I know! I still have 2 Revere Ware fry pans and a saucepan and the bottoms are filthy. Also have some BBB Calphalon knockoffs. I will not buy new cookware until I have access to a decent stove. This is amusing me as I got my very first Calphalon pan the other day –it’s a big ol’ braising pan that someone was giving away on their doorstep for free. Now I need to find recipes that involve braising things. I still have one Revere Ware saucepan that I bought when I moved to Chicago for grad school. Most of the rest fo what we have is the All-Clad set we registered for and various flea market finds (cast iron, etc.) Good on you for saving yours for the next generation. Had I known about All-Clad earlier, it would have been in the wedding registry. As it stands, I have three pieces: 14-inch sauté, 3-quart saucepan, and 2-cup saucepan.